Though the benefits of defragging your hard drive are minimal in this day and age, after long periods of heavy use, a pass on the platters with a defragger isn't a bad idea. Iobit's Smart Defrag 3 is about as good a program as you'll find at optimizing your files at the block level. And it's free. Smart Defrag 3 offers both a classic Windows, and a Metro look that appears right at home in the Windows 8.x modern GUI. I like the 2D Metro look even under Windows 7 so I stuck with that. As a company, Iobit has made hay with the Metro interface, offering both a classic start menu for Windows 8 users, and a Metro-style interface for XP/Vista/W7 users. 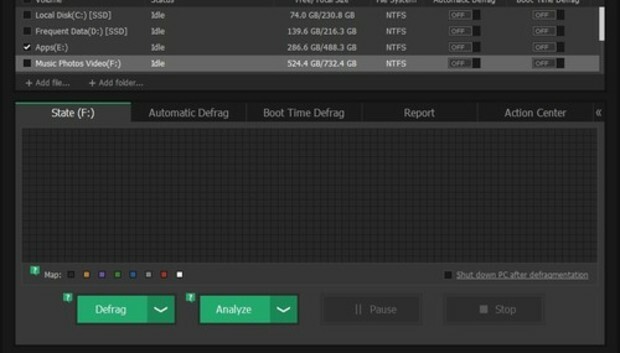 Smart Defrag is easy to use and smart enough not to auto-select SSDs for defragging. Defragging has no effect on SSD performance and simply wastes an SSD's precious read/write cycles. In other words, don't do it. In addition to normal whole-drive defragging, Smart Defrag 3 will also limit operations to partitions, single files and folders. This can help reduce load times for frequently used files without costing you the time a full defrag requires. There's also boot time defrag and a scheduled defrag, but I suggest you skip the latter option as defragging more than once every few months takes more time than it saves. Necessary or not, In my testing Smart Defrag 3 did a very good job, and wrapped things up rather quickly given that all my hard drives are 2GB or larger. Smart Defrag 3 is free, but it's a loss leader for Iobit's Advanced System Care and will install that as well unless you un-check the option. There's also some minimally invasive advertising for Advanced System Care inside Smart Defrag 3. Ads aside, if you have a drive that's been in heavy service for a while, or want to defrag a heavily used folder without wasting time on a whole-drive operation, there are worse choices than downloading Smart Defrag 3 and letting it straighten things out.